Some parts require we get your chassis code in order to know what options your car came with. The chassis code is NOT the VIN#. 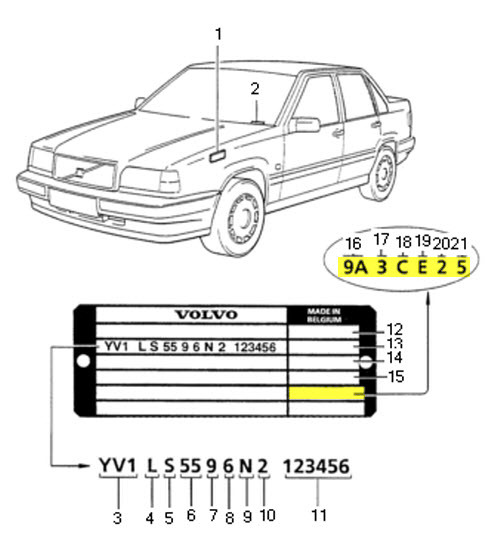 The Vehicle Identification Number is sometimes called the chassis number but what we need is the chassis number Volvo used to build your Volvo's suspension and steering systems. The chassis number is on a identification plate which is usually located on the drivers side (left) inner fender well under the hood. This plate will have many numbers and or letters. We need the numbers/letters located in the bottom right side of the ID plate. Normally it is in the second from the bottom, right side cell.